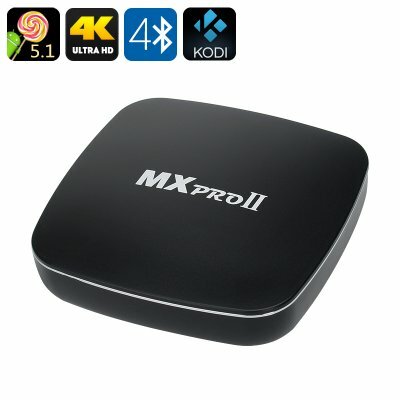 Successfully Added MX Pro II Android TV Box - 4K, Amlogic S905 Quad Core CPU, Bluetooth 4.0, Android 5.1, Kodi 15.2 to your Shopping Cart. Getting bored with your old TV set? It may be time for an upgrade, but that doesn't mean you have to spend a fortune on the latest home entertainment equipment. This small MX Pro II Android TV Box comes with everything you need to set up a home theatre and just at a fraction of the price! The MX Pro II brings the improved Android 5.1 interface straight to your large screen - with Screen Pinning, Smart Lock and unlimited Play Store access. Enjoy effortless navigation with familiar intuitive interface and load up on cool apps, games and tools. You will have 8GB of internal memory and up to 64GB supported on external sources. The TV box guarantees great quality when you watch your sports, blockbusters, TV shows and more. The Amlogic S905 Quad Core CPU makes sure you experience no lagging and enjoy a smooth performance and multitasking. Gaming is enhanced with Mali-450MP GPU — so get ready to game away! Kodi 15.2 comes preinstalled on this model — so you can enjoy loads of free content and a player to watch it with right away, no extra installations needed. With Bluetooth and Wi-Fi support, the TV box can easily communicate with other devices. Hook it up to external speakers or wireless headphones. The MX Pro II Android TV Box comes with a 12 months warranty, brought to you by the leader in electronic devices as well as wholesale Android TV boxes..